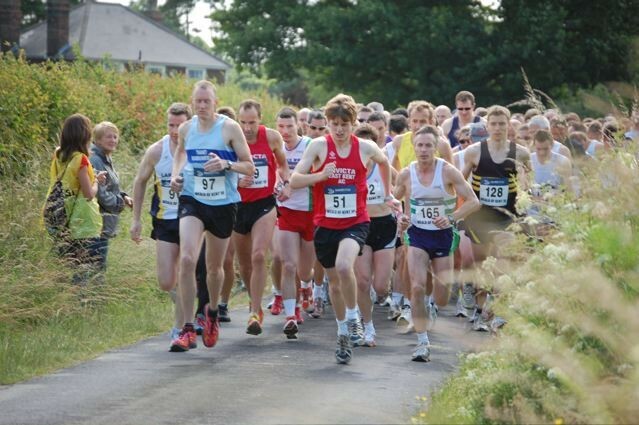 The Club Championship is an annual event, comprising 9 events, 3 each at 10k, 10m and 1/2 Marathon. The races are mainly in Kent, with the occasional excursion into Sussex or Essex. Points are scored in two ways – firstly by finishing position, and secondly by earning bonus points if a personal best is achieved. There are four categories within the Club Championship: Ladies, Senior Men, Male Veterans (40+), Male Super-Veterans (50+). The category within which a runner competes is decided for the year based on the runner’s gender and age on the date of the first club championship race they complete in the year. The runner then remains in that group for the whole of the calendar year. The Ladies, Senior Men and Male Vet 40s groups are split in to two divisions, A and B, based on performance. The scoring system is the same in all divisions. The first runner home in each division receives 25 points, the second 24 and so on down to 5. All runners who complete a Club Championship event will receive at least 5 points. Bonus points are awarded for setting a personal best: 3 points for setting that personal best, plus an extra point for each full minute under a previous personal best, up to a maximum of 7 minutes. A personal best is defined as the best time set since 1st January in the last three years, so for 2013, that means since 01/01/2010. Where available, positions within races are decided by chip times. Where these are not available, gun times will be used. There are ten races a year, at least three at each of 10K, 10 miles and Half marathon distance. Runners count their best SIX scores from these races towards their overall totals. When a new member takes part in his or her first race, he or she will be placed in the A division if he or she beats at least one runner from that division; otherwise, he or she will go into the B division. The same rule will apply to more established club members who take a break from club championship races and then return. Where a runner is due to age up in the course of a year, they will compete in the age bracket for which they qualify in the first race they complete. Thus, a runner who turns 50 on 1st February would compete for the year as a Vet if they did a Club Championship race in January, or a Supervet if they did not do their first club championship race until on or after 1st February. At the end of the season, the division sizes will be rebalanced, based on the actual number of runners taking part within the category. Any runner who scores zero for a season will be removed from the list entirely, and allocated to a division as if he/she were a new member when he/she returns. All club members who take part in a designated club championship race will be awarded points for that race. All points awarded for races between the AGM and 30th June are provisional, pending the runner paying the following year’s subscription. A member whose subscription remains unpaid after 30th June will be ineligible to receive points for any races after that date, until the subscription is paid in full. In the event that a member scores points for a race and then leaves either by design or default, those points will remain with that runner until the end of the year.